The ACC Chapter of TACHE includes faculty, staff, administration and students of Austin Community College. We support the goals of the statewide organization and have focused primarily on the access, participation, retention, and success of Chicano/Latino students in higher education. We invite all employees and students of Austin Community College to join our chapter, attend our meetings, and become involved in our activities! Fundraising for ACC student Scholarships. Helping organize ACC educational programs. 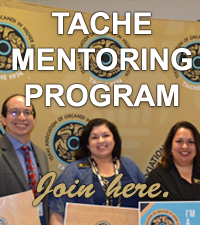 Providing professional development and leadership training for members. Supporting increased representation of Chicano/Latino staff, faculty and administration. We invite you to join us at one of our meetings and welcome your participation and contributions! In December 2002 TACHE was honored by being named an affiliate organization at ACC by Dr. Richard Fonte, former President of ACC and currently President of College of Lake County in Grayslake, Illinois. Dr. Magdalena H. de la Teja, Dean of Student Services, was named the Official Representative to the Office of the President for the TACHE affiliate organization. On December 9, 2004, the statewide TACHE Board granted ACC permission to establish its own ACC TACHE Chapter and approved its new constitution and bylaws. Thereafter, the new chapter members elected the first slate of officers who took office January 3, 2005. The inaugural officers were: Dr. Magdalena H. de la Teja, President; Dr. Richard Armenta, Vice President; Mr. Javier Olguin, Secretary; Mr. Albert Perez, Treasurer; and Ms. Nancy Vargas, Membership Coordinator. These individuals lead the ACC TACHE Chapter with the knowledge that there were many other ACC faculty and administrators who provided leadership for TACHE activities at ACC in the past, notably Dr. Ramon Dovalina, Past President of Laredo Community College; Laredo, Texas and Dr. Margie Huerta, Campus Executive Officer, Doña Ana Branch Community College of New Mexico State University; Las Cruces, New Mexico. Our chapter works with Dr. Richard Rhodes, ACC President, to meet its goals of road to equity, scholarship fundraising, improved Latino/Chicano student access and success, increased representation of Latino/Chicano within the ACC faculty, staff, and administration, and gaining HSI status. Our chapter also has worked with an active participation in the selection of the ACC President, Dr Richard Rhodes, through the Sobre Mesa forum.